As we work to deliver on our company mission of empowering every person and organization on the planet to achieve more, we have increased our focus on helping people across their work and personal lives. Offering tools for whole life experiences has never been more important as many of us are living a digital lifestyle that presents more opportunities, yet more demands on our time, than ever before. Your Phone app allows you to view, send and receive the SMS from your Android, on your PC. Timeline makes it way easier to find what matters to you across your devices. Featuring our PixelSense™ Touch Display, Surface Pro 6 adapts to help you take your ideas to the next level and create your best work with Office 365 on Windows. Ultralight at 1.7 pounds with the versatility of the 165-degree kickstand, create your own space in a café, train, plane or couch. Surface Pro 6 continues to innovate the category by delivering the first quad core processor to a 2-in-1 form factor. Personalize Surface Pro 6 to suit your style with a choice of two classic colors — Platinum or bold, new Black. Surface Pro 6 continues to innovate the category by delivering more power, without compromising thinness, weight and battery life. Now with the latest quad-core, 8th Generation Intel® Core™ processor — Surface Pro 6 is 1.5x faster than previous Surface Pro — while offering the same all-day battery life. With choice to further personalize more than type covers, Surface Pro 6 will now be available in an all-new sophisticated black finish. 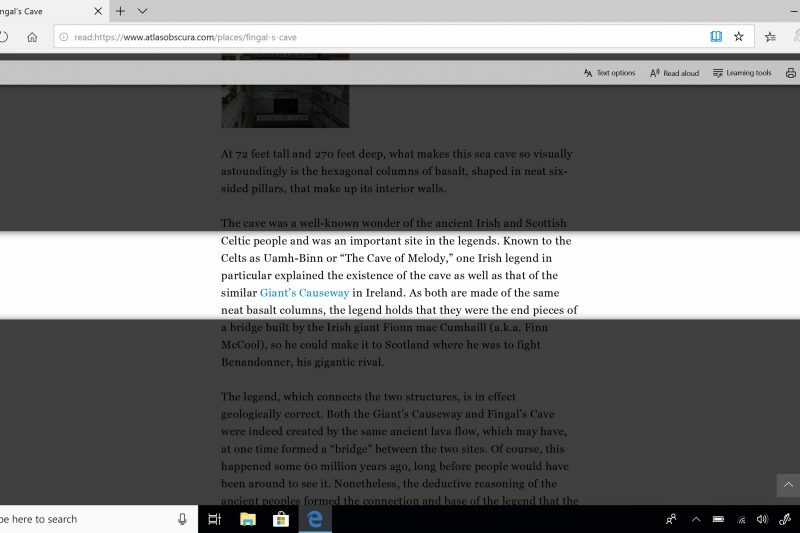 Surface Pro 6 makes it easy to work and play anywhere. Make it a full laptop experience with our Surface Signature Type Cover, Surface Pen, and Surface Arc Mouse. Surface Laptop 2 continues to deliver the perfect balance, enabling you to get more done. Surface Laptop 2 is sleek and light, with improved speed and performance, and no compromise in weight and battery life. Powered by the latest 8th Generation Intel® Quad Core™ processor, browse, stream and create faster. Now available in four colors, including Burgundy, Cobalt Blue, Platinum and the all-new matte Black. Let your ideas flow through your fingertips, with a vibrant, 13.5” touchscreen. With up to 14.5 hours of all-day battery life, more battery life than any MacBook and MacBook Pro. Thin and light, starting at 2.76 pounds, Surface Laptop 2 fits easily in your bag. Surface Studio 2 is the most powerful Surface ever, built for creators who need vibrancy, high graphics performance and fast processing. Capture each stroke as you intended with Surface Pen and match the speed of your imagination with a twist of Surface Dial. 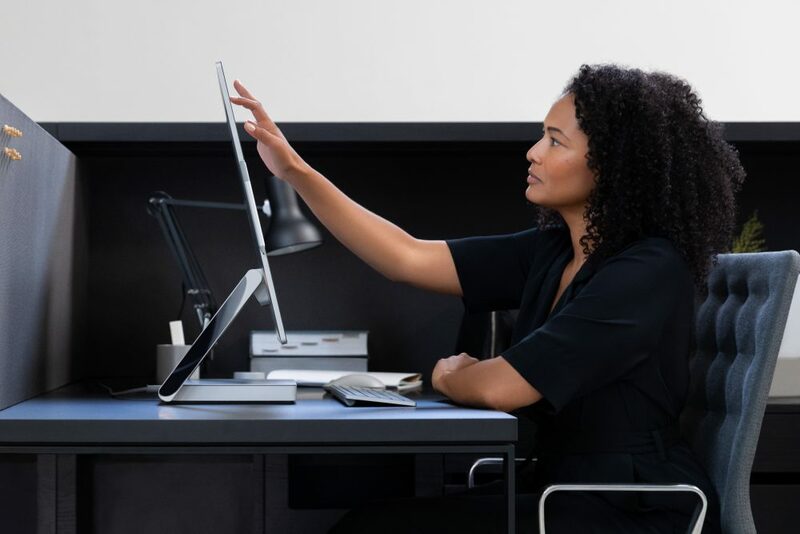 Surface Studio 2 packs professional, productive power into a sleek and thin 12mm digital canvas with 38 percent higher luminance and 22 percent more contrast3 than its predecessor. Surface Studio 2’s 28” display was calibrated to deliver the most accurate colors possible. The new Surface Studio 2 has 50 percent faster1 file handling than its predecessor with full SSD hard drives. Use Surface Studio 2 in Desktop Mode or Studio Mode in a modern executive office or easily transform it into a digital drafting table. Transform your desktop into your studio to work at whichever angle you need to be your most creative. With its magnificent 28” PixelSense™ Display, Surface Studio 2 packs professional, productive power into a sleek and thin 12mm digital canvas. Surface Headphones help tune out or tune in wherever you are, slipping slip comfortably over your ears to surround you with spectacular sound quality and 13 levels of ambient noise control. Surround yourself with spectacular sound quality and easily adjust volume and noise cancellation levels with new, intuitive on-ear dials. Head detection automatically pauses the music or mutes calls when you remove them and restarts them again when you are ready. Designed for amazing audio experience balanced with great voice allowing you to move from music and movies to Skype calls with high quality. 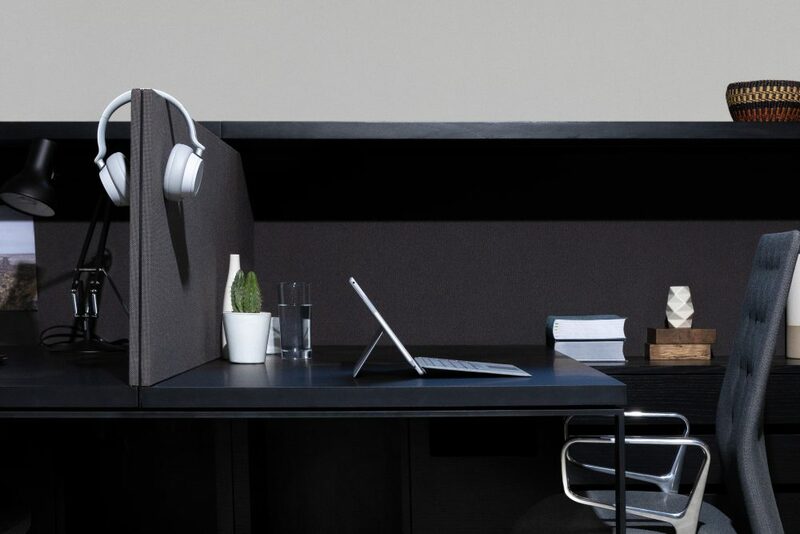 The premium materials, memory foam and overall balanced design make Surface Headphones easy to wear for a full day of travel or knocking out a big project at the office. Designed from the inside out, Surface Headphones provide a comfortable, balanced design to help get you in your flow and focus. Designed with Skype in mind, there are two beam-forming microphones on each ear cup to focus on the sounds you want to capture, for excellent call experiences. Custom free-edge drivers provide the amazing sound quality you expect from a premium headset, allowing you to listen to music or watch videos with clear, crisp sound. 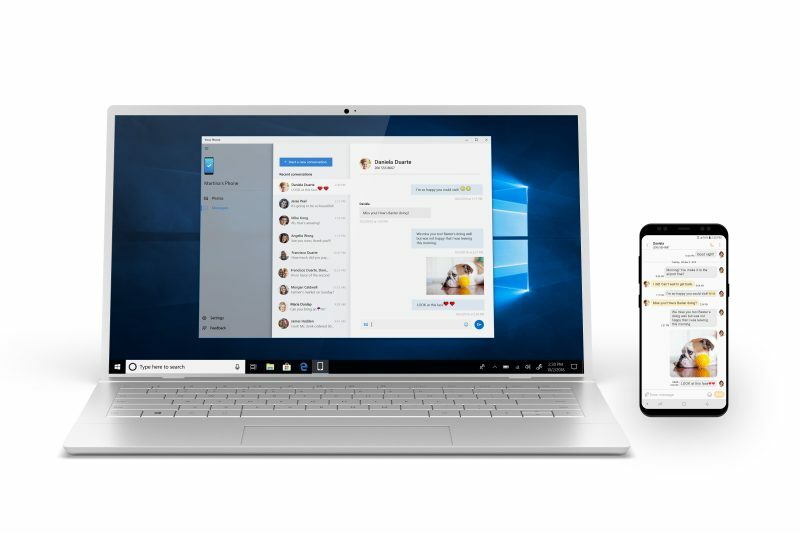 New Surface devices, along with new innovations in Windows and Office 365, offer more performance and productivity across your whole life. Browse, catch up with friends or stream your favorite music and movies on Netflix and Spotify on the faster, more-powerful Surface Laptop 2. 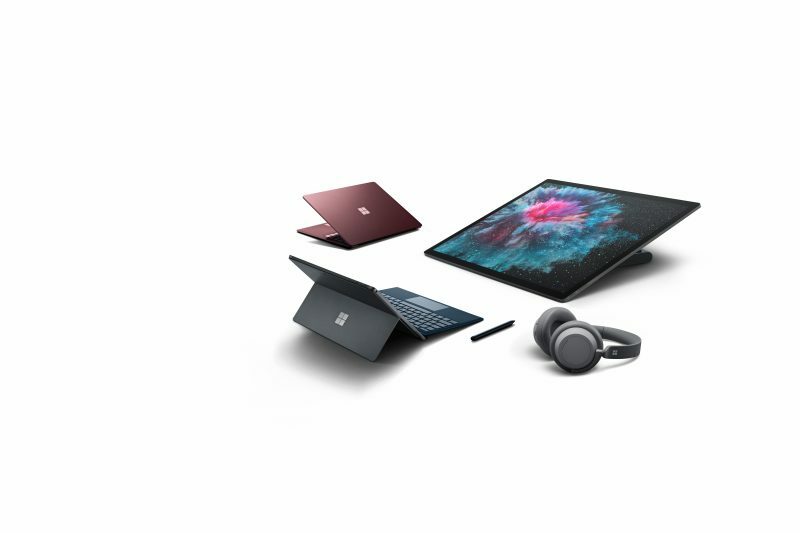 Complement your style with the all new matte black Surface Pro 6 and Surface Laptop 2. Creation becomes second nature with tools designed to unleash a seamless flow of ideas. Easily connect Surface Headphones to your Windows 10 PC right out of the box by enabling Swift Pair. Surface Studio 2 is the ultimate creative studio, with the same premium design you know and love. Surface Studio 2's improved performance handles demanding software that enables you to edit stunning photographs, run circles around renders and create rich 3-D images. Surface Pro 6 is ultralight at 1.7 pounds, so you can create your own space in a café, train, plane or couch. Designer can take a simple block of text, understand the context using AI, and then provide design ideas using icons and Smart Art. Powered by To-Do, easily schedule items by dragging a task to your calendar. Powered by To-Do, you can now create tasks by dragging and dropping an email to your task list. Microsoft Forms is a simple, lightweight tool for creating surveys and quizzes. 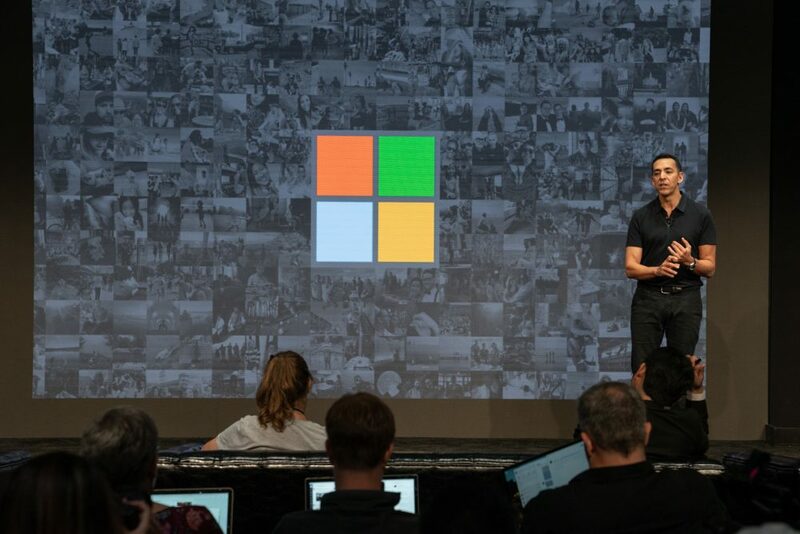 Panos Panay, Chief Product Officer, at the October 2 event in New York City. Yusuf Mehdi, Corporate Vice President, Modern Life & Devices, at the October 2 event in New York City. Shilpa Ranganathan, General Manager, Mobile & Merchandising Experiences, at the October 2 event in New York City.